When designer and clients clicked, a Glen Arbor condo came alive with a personality all of its own. 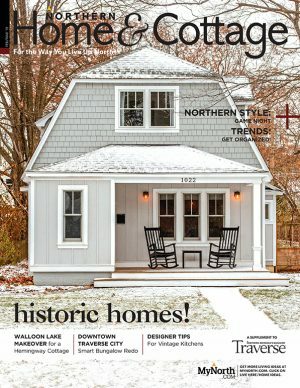 “We want this place to feel like a warm hug.” That was the extent of the design direction that homeowners Tim and Patty MacEachern gave to Liz Jerore before she launched a thoughtful redesign of the couple’s lake-view home at The Homestead in Glen Arbor. Interpreting an abstract request like that can only result in success when a designer and client enjoy a highly collaborative relationship. And that, says Jerore, is a guiding principle for how she runs her business, At Home Cabinetry and Interiors in Traverse City. The partnership began when Tim and Patty asked Liz to design their “Deer Den”: a handsome getaway space where Tim houses part of his large collection of model cars. 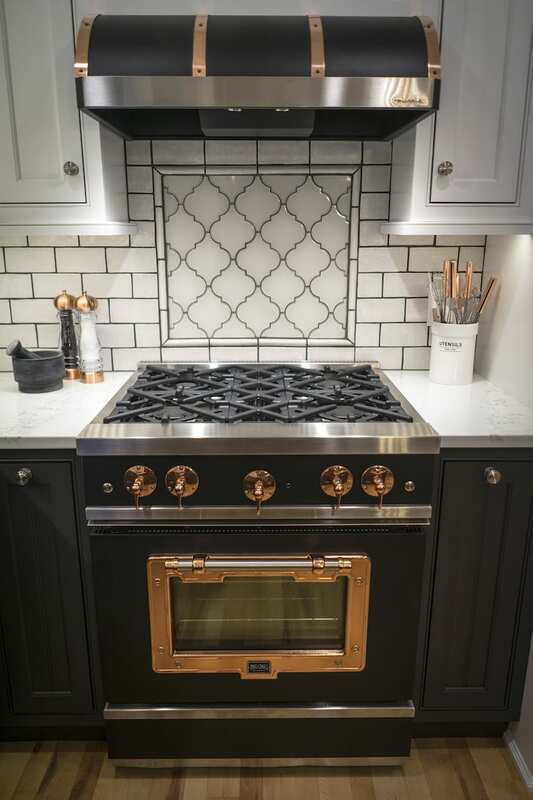 Later, they called on Liz when the need to replace a broken stove ballooned into a full-fledged kitchen remodel. The MacEacherns then realized that the whole house should follow suit for a completely updated and consistent look. Liz developed a plan that prioritized smart use of space, an elegant yet modern aesthetic, and the couple’s vague but heartfelt design direction. To add to the challenge, the project included some existing built-ins as well as a set of treasured silk blend rugs woven in a traditional motif. Careful color and fabric selections help these elements naturally flow with the new design. The plan included custom cabinetry with clever storage solutions in every available space, character maple flooring, standout carpentry and lighting—all enveloped in a complex materials palette. The broad mix of materials in the new décor prevents the stiffness that can come from a “matchy” look. 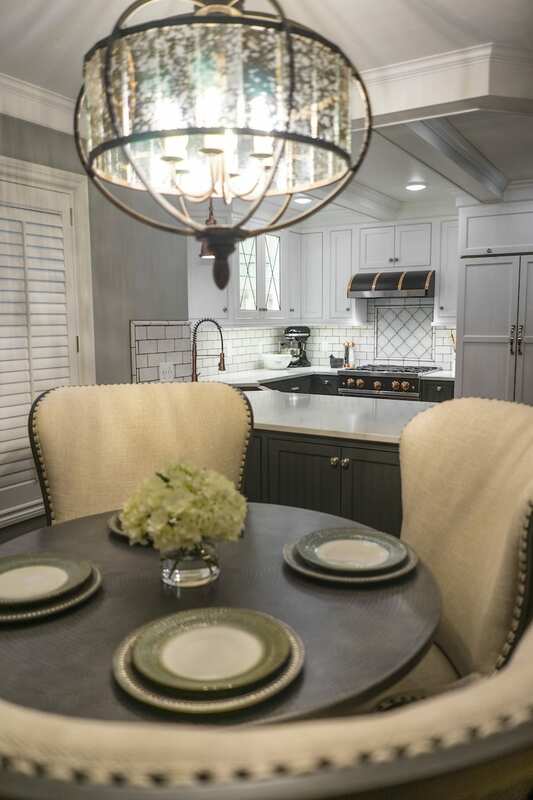 “There are so many metals in here!” says Liz, as she points out the gleaming copper and nickel in the kitchen, matte black bath fixtures, and an iron chandelier over a pewter-finished table. It all works thanks to careful attention to proportion, color and details—lots of them. 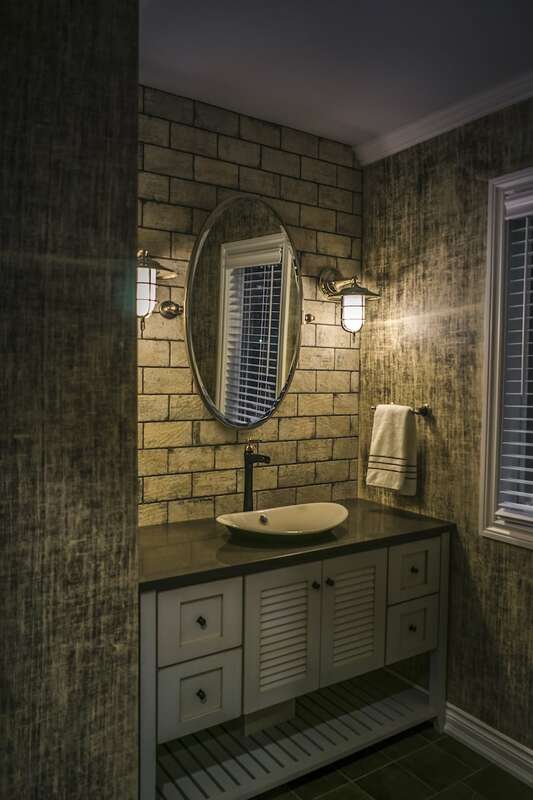 Traditional textures appear in an artful mix of tiles in the master bath, a custom paint treatment in the powder room, and houndstooth wool on the backside of a chair. Other elements seem a bit industrial, like the new black steel spindles on the staircase, a major design feature visible from the entire main floor. There’s also a custom mantel with exposed bolts, an unexpected feature that casually balances the more formal elements. What sounds busy merges into a warm and alluring harmony. Building consistency from one floor to the next in the three-floor hillside space required careful planning. Liz explains how the new crown mouldings required slightly different sizing on each floor to appear consistent. 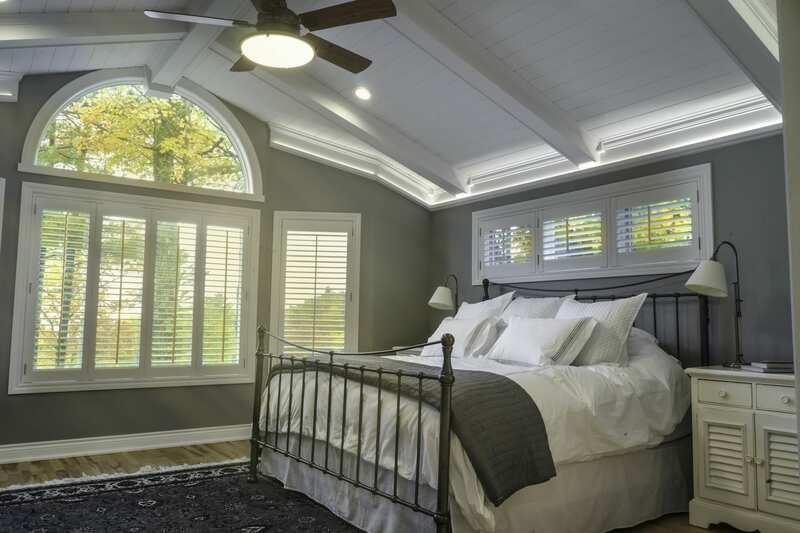 She also used coffered ceilings to help define spaces with a hint of luxury. A single paint color—an icy gray with a blue cast—ties everything together. “It’s luxurious but not ostentatious,” says Liz. The master suite illustrates her point. Its elaborate ceiling is a marvel of carpentry and lighting, yet the room’s small scale and long view to the water make it inviting. 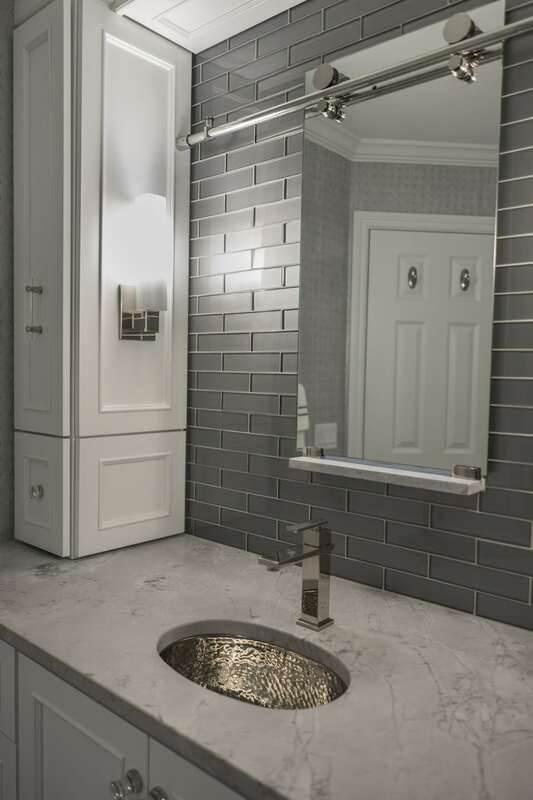 The tiny bathroom is as smart as it is luxe, with custom storage dressed in gleaming nickel, tile, and glass. There’s even a mirror that slides over a window, offering the option of natural light or privacy. On the main floor next to the kitchen, Liz outfitted a breakfast space to become an indulgent lounge area with a generous round table and wooden chairs with backs that rise high and curve around those seated. Indeed, a most fitting embrace for her clients and partners in design. Tile: Tilecraft, Traverse City, 231.929.7207, tilecrafttc.com.